This is a Monday morning kind of bread. This is a “I don’t want to get out of bed” kind of bread. A “I just need one more second of vacation” kind of bread. The kind of bread you make when you don’t want to grow up, when it’s your birthday and you want to put Nutella on it (like a bird), when you just know you’re going to have a bad day so you need a slice (or three) of this bread to make it a good one. Or, when you’re having a good day and you just want to keep it that way. Now that you’re sufficiently drooling all over your keyboard, head over to the lovely Pass the Cocoa where I’ve shared a guest post on this scrumptious Nutella-swirled banana bread. Please note that, yes, all anecdotes about the deliciousness of this bread are not from me but from my taste-testers because I’m allergic to bananas. So also, YES, it was the most torturous torture of all tortures making this loaf and not being able to actually take a legitimate bite of it. Good thing I had a spoon and extra Nutella nearby to console myself. That photo is killing me!! I need this bread! It looks awesome!! Monday morning never looks so good! That totally stinks! But this sounds amazing and looks gorgeous… I want the entire loaf for myself! I experience that mood too often and it shows by the number of empty nutella jars in my trash. i love the use of hazelnut nut meal in it, makes it more tender from my experience. I don’t want to get out of bed and I definitely don’t want to grow up. Please overnight me a loaf of this bread lady! It looks AMAZING! It really invites you to TAKE A BIG BITE! Looks glorious! Gerry — SERIOUSLY. 🙂 Thank you! Laurie — Tell me about it! At least I can still eat the Nutella 😉 Thanks, dear! Belinda — Ha, I know how that goes 🙂 Thank you! dishing up the dirt — I wish I could hand you a fresh loaf right through the screen! Thanks, lady! Bunny — That’s the only way to eat it! 😉 Thank you! I wish I were still in bed and someone brought me a slice of your nutella banana bread. Now THAT’s how you start a Monday! If I had this right now, my life would be so very happy. Julia — Fo’ realz. 🙂 Thanks, lady! Erika — A loaf is the only appropriate serving size for this, really. 🙂 Thanks, love! Holy moly, YES! That is the most mouthwatering banana bread I’ve ever seen, Stephanie! Amazing job. My ripe bananas on the countertop are BEGGING to be used for this recipe, haha! Okay, WOW. Any kind of day is the right day for this! YUM! Do wha? This is flipping epic!! Marie — Haha, I agree! Thanks dear! Lauren — Lol, thank you love! That photo is seriously making my mouth water. I just made banana chocolate chip bread yesterday and now I’m kicking myself for not using nutella! This looks amazing. Going to check the guest post out now! That’s so funny. I made one not to long ago and everyone ate it up before I could snap a photo! Abbe — Haha, I understand — it can be hard to fend off the wolves, especially when Nutella is involved. 🙂 Thanks for the comment! Thanks so much again for guest posting for Pass the Cocoa! I absolutely love this recipe you chose (being the Nutella-lover that I am), and your description is delectable! 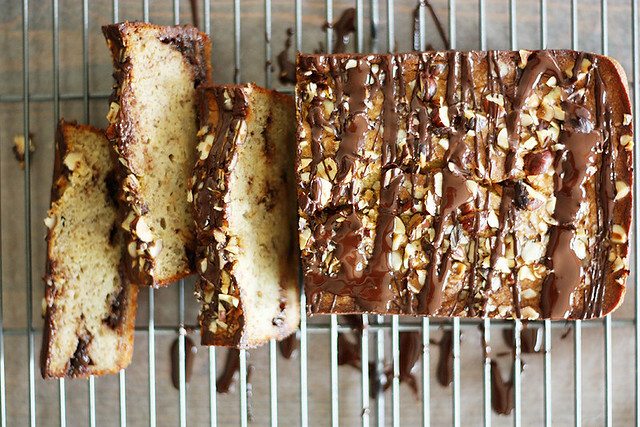 You’re killing me with that Nutella swirl – *love* this bread! Laura — Oh trust me, I’m dying over here over it, too 😉 Thanks, love! Holy cow! That is an epic-ly gorgeous banana bread. This bread looks phenomenal. I love how you use nutella for this. I love that you are a Portlandia fan. My husband just can’t get into it. These flavors are a perfect match. Can you send me a piece? I’m currently on a juice cleanse…and now I know how I’m going to break it. This looks SO GOOD. Good thing I have a bunch of over ripened bananas on my counter…pinned! Stefanie — Ha! Glad you enjoyed the reference. 🙂 I have a love/hate relationship with that show but I do love the “put a bird on it” segment. And yes, I wish I could mail you a whole loaf right now! Wow! That looks incredible! I’m heading over to get the recipe. Will be putting this on my to-bake list. Rachel — Oooh good on you, girl, for going on a juice cleanse! I do NOT have the willpower for those. 🙂 Keep it up though and you can make this bread as a prize! Holy cow, that is one gorgeous bread!! I would love a piece of that. Wonderful photo! This is more like “I’m-in-heaven-kind-of-bread” for me! Oh the coincidence!! This is exactly the bread I made last week! Great minds. and you’re allergic to bananas?! Dislike. I made a Nutella pound cake a few years ago that was mind-blowing. Truthfully, I’m not the biggest fan of Nutella, and don’t keep it around unless I’m going to use it in a recipe BUT as it happens….. I have a jar in the pantry that I bought for something AND a stash of naners in the freezer SO this might just be happening in my kitchen. Sooner than later. Because wow. Who wouldn’t swoon in to oblivion over THAT?! Kate — It’s obviously a sign! 😉 And um, Nutella pound cake? I’m drooling. A couple of slices of this amazing bread would make this very long day so much better! I have made so many banana breads but never with nutella. Can’t wait to try it out!